It was a big day for all on at Wrigley Field! Informatica and Infoverity’s customers gathered with guests to share how they are changing their game and driving critical initiatives that power innovation and modernize IT to meet increasing demands. Andrew McIntyre, Vice President, Information Technology, Chicago Cubs. 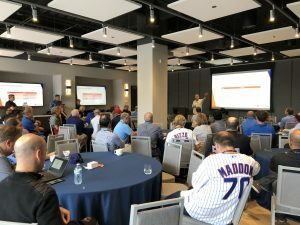 Andrew discussed how the Cubs are meeting their challenges around new Big Data sources, such as improving communication feeds between the 30 MLB teams as well as improving their customer’s experience at the ballpark and its surrounding properties. Dilip Balachandran, Director of Enterprise Architecture & Data Analytics, USG. Dilip described how USG is defining their business technology strategy and IT operating model to drive digital transformation and revenue growth, by leveraging a Hadoop infrastructure to accelerate value to their business analysts. Ray Bernier, IT Director, Grant Thornton. Ray discussed how Grant Thornton has simplified their hybrid data environment through the implementation of an Integration Hub, making it simple to ensure all data gets to the right place – whether on-prem or in the cloud. 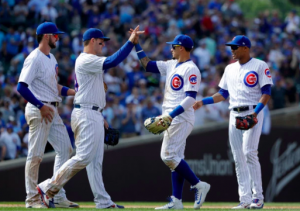 After the discussion, attendees enjoyed the great game at Wrigley Field, where the Chicago Cubs beat their rivals, the Los Angeles Dodgers, 4 – 0.